Irene Joliot Curie was a nuclear chemist at the Institut du Radium. She was awarded the 1935 Nobel Prize in Chemistry with Frederic Joliot Curie "in recognition of their synthesis of new radioactive elements." September 12, 1897Birth, Paris (France). 1925Obtained PhD in Chemistry, University of Paris-Sud (Université Paris-Sud), Paris (France). 1932 – 1952Lecturer (1932-1937); Professor of Chemistry (1937-1946); and Director, Radium Institute (1946-1952), University of Paris (Université de Paris), Paris (France). 1935Awarded Nobel Prize in Chemistry with Frederic Joliot-Curie "in recognition of their synthesis of new radioactive elements". 1936 – 1950Undersecretary, State Scientific Research and Director, French National Center for Scientific Research (Centre National de la Recherche Scientifique), Paris (France). 1946 – 1950Director, Institut Curie, Paris (France). March 17, 1956Death, Paris (France). Mother. Graduate advisor at Paris-Sorbonne University (Université de Paris). Husband and share 1935 Nobel Prize in Chemistry "in recognition of their synthesis of new radioactive elements." Undersecretary, State Scientific Research and Director. Obtained PhD in Chemistry (1925). Lecturer; Professor of Chemistry; and Director, Radium Institute. Curie and Joliot-Curie Archives, 1914-1958. Glenn T. Seaborg papers, 1866-1999 (bulk 1940-1998). How it came about, circa 1963. Les cyclotronistes du college [videorecording], 2006. Max Born Journey to Russia, 1945. Niels Bohr scientific correspondence, supplement, 1910-1962. Oral history interview with Aristid Victor Grosse, 1974 January 11 and April 5. Oral history interview with Helene Langevin-Joliot, 2003 April 13. Oral history interview with James Chadwick, 1969 April 15, 16, 17 and 20. Oral history interview with Lew Kowarski, 1969 March 20, October 19, 20, 21, 1970 May 3, 14, 1971 May 15 and November 20. Oral history interview with Lew Kowarski, 1974 November 20 and 2 August 1976. Oral history interview with Wolfgang Gentner, 1971 November 15. Pais Prize Session [sound recording], 2017 March 13. William B. Meloney collection on Marie Curie, 1920-1943. Correspondance; choix de lettres, 1905-1934 [de] Marie [et] Irène Curie. Présentation par Gillette Ziegler. L'électron positif / par Irène Curie et F. Joliot. Les radioéléments naturels : propriétés chimiques-préparation-dosage. Oeuvres scientifiques complétes : Frédéric et Irène Joliot-Curie. Contributions of 20th century women to physics [online resource], 1900-1976. 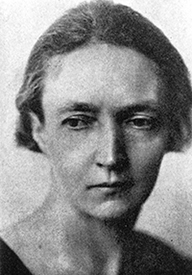 Irène Joliot-Curie Nobel Prize biography. Les Curie : deux couples radioactifs / par Pierre Radvanyi.